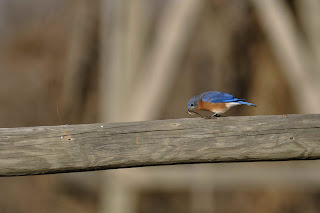 Went out to Mahonney State Park today hoping to see a bluebird. Sure enough. They were everywhere. I am still learning about these amazingly beautiful little birds. This guy was gathering stuff. I am not sure why. I assume it was for a nest. But I would have thought he would have had one by now. Anyway - what a great way to spend a November morning in NE. It got to 70 here. Definitely a bluebird kind of day.